To produce Organic Coconut Oil, we only use fresh, hand- harvested coconuts, grown in organic certified coconut plantations. Under hygienic conditions and constant quality controls the fresh coconut flesh is first cold pressed, then filtered. Followed by a sophisticated, centrifugal process. The entire pressing process is done gently and carefully, without any chemical additives, so that the freshly pressed coconut oil remains as natural as can be. 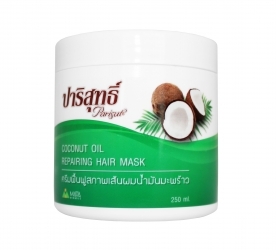 This preserves the natural composition of Parisut VCO and guarantees the high content of vitamins, minerals and medium- chain fatty acids as well as the wonderful fresh and pure coconut aroma.